Made in China and crafted from ceramic, this sake service set comes with a sake jug and four matching sake cups featuring the famous work of Katsushika Hokusai, a famous woodprint artist during the Edo period in Japan. 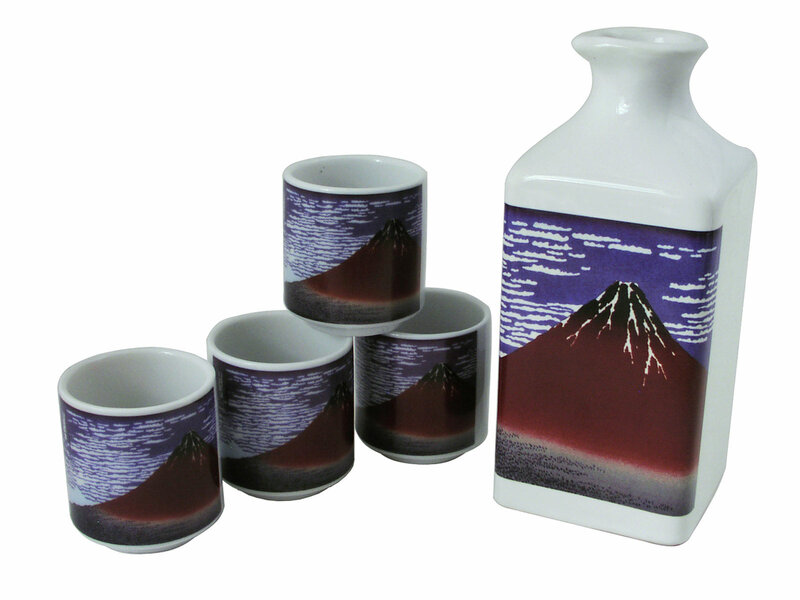 Hokusai's most famous series of woodblock print-the thirty six views of Mount Fuji, from which the design for this sake set is taken, showcases the majesty and the grace of Mount Fuji in various seasons. In gorgeous shades of deep red and maroon, set against a blue sky, the beauty of Japan’s Mount Fuji is showcased on this sake service set. Lipped rim on the sake jug makes for easy pouring of sake. Whether you like your sake chilled or warmed, this sake service set makes a wonderful addition for fans of sake and Hokusai’s work. Item is microwave and dishwasher safe.